Government plans for directly elected Police and Crime Commissioners in England and Wales are supported by a third of the public, a survey suggests. The research by the think-tank Policy Exchange also suggested politicians were considered least suitable for the role from a choice of six backgrounds, which included ex-military officers. A YouGov poll of 1,711 people said 34% thought PCCs were a "good idea". The Home Office said PCCs would "give a voice to the public". 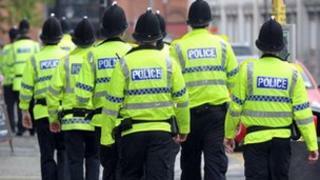 PCCs will replace police authorities in 41 areas in November. They will have powers to hire and fire chief constables, set police force budgets and commission some criminal justice services. Of those questioned, 34% said they were a "bad idea" and 32% "didn't know". Even Conservative voters are not convinced, with only 44% of the survey's 396 Tory respondents saying they were a "good idea". The poll results are a blow to the government which has championed the idea of PCCs as a way of making the police more accountable. They are likely to fuel concerns about a low public turn-out when polling for the Police and Crime Commissioners takes place on 15 November. There were particularly strong views among people who had had contact with police or been a victim of crime in the past year, with about 40% saying PCCs would be a "bad idea". When asked who would make the best PCCs, 6% said former government ministers, MPs and senior politicians would, with 7% saying local councillors and local politicians and 13% saying those with business experience. A majority of those surveyed, 59%, thought former police officers would be the best candidates, while 29% favoured ordinary people with an interest in the issues, and 26% wanting someone with a military background. A further 16% said they did not know who would make the best candidate. But the Home Office said it was confident that as PCC elections approached, the public will respond positively. "We believe that the more people hear about this reform, including from candidates who are only now being selected, the more they will like it," a spokesman said. He added, "PCCs will give a voice to the public, strengthening the fight against crime and helping to ensure that local communities are kept safe. "As we approach the elections, local and national media interest will grow, and we also intend to run a high profile information campaign to ensure that people know about this important change." Labour published its list of candidates on Monday which included only one former police officer - Ron Hogg, who is standing in Durham. There were nine serving or former police authority members - who are not police officers - and seven former government ministers or MPs. The list also included a number of councillors and community figures. The Conservatives have still to decide who all of their candidates are, but the one leading police figure who wanted to stand, Jan Berry, the former chairman of the Police Federation, has not been selected. One of the few ex-army officers to express an interest in the job, Colonel Tim Collins, has pulled out. The policies which voters said would make them more likely to vote for a PCC were moving officers into neighbourhood policing teams, seizing more assets from convicted criminals and keeping police stations open. The most important crime priorities for PCCs were anti-social behaviour and disorder, making the police more visible in the community and dealing more effectively with young offenders. Only a minority, 20%, said they would be prepared to pay more council tax so more could be spent on policing. Do the public want police and crime commissioners?